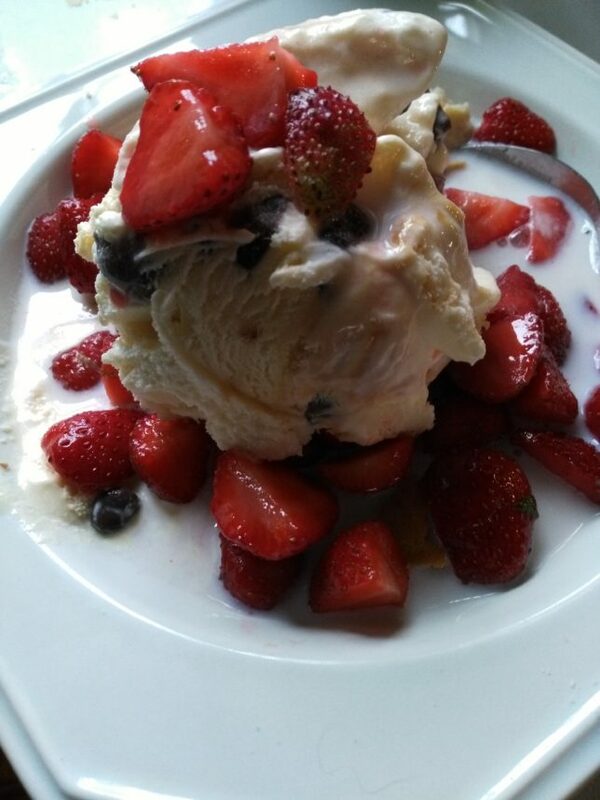 Improvised with Turtle Tracks ice cream…. It was awesome! Strawberries spend most of June in season where I am, and straggle to some degree on ever-bearing plants for a while longer. Growing up at our house strawberry shortcake was a special treat every summer. What I have found out since I had kids of my own is that it is a tradition that goes back at least 3 generations (or 4 depending how you count). When my Grandma was growing up it was a meal her family had when they were picking the berries from the garden. I wish I had that many plants. She continued it with her kids, and Mom continued the tradition as well even though we bought the berries from one of the fruit stands along the road. And despite protests from their dad’s side of the family, I do the same with my kids. Mom always seemed to have some recipes that she didn’t have to look up. Since she passed we have tracked some down. 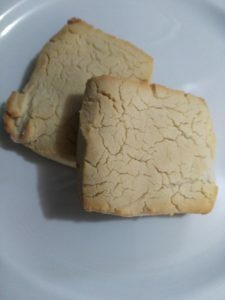 She always used to tell me — “it is just a basic biscuit recipe, just throw in a few Tablespoons of sugar.” As I’ve told you before I am not the best cook in the world, and obviously don’t have it memorized, so I thought I would share. Set oven at 450 degrees F. Sift flour once. Measure. Add salt and baking powder; stir well and sift together. Cut fat into dry ingredients until it is the size of rice kernels. Make a well in the center of the dry ingredients, add milk and stir vigorously with wooden spoon until blended or until dough follows the spoon. Lightly flour countertop using about 1 T. flour. Form dough into a ball and knead lightly with fingertips about 10-15 times. Roll to about ½ inch in thickness. Dip cutter into flour. Cut and place on unoiled baking sheet. Bake until golden brown (about 12 to 15 minutes). Full recipe makes 16 to 18 small biscuits. — Today I made a few modifications as I am now gluten free. I used a mix of brown and white rice flour (literally as I found stashes of flours I tossed the contents of the bags in my bucket and stirred, so it might also have some other flours, but I will work on standardizing in the future). I also substituted honey for the sugar, added an egg, and then had to add about a quarter cup of flour. They came out a decent texture, but a bit dryer than I really like. In our world strawberry shortcake is a full meal, complete with lots of fresh berries (cut up and add a little sugar to draw the juice out), shortcake, vanilla ice cream, and milk or berry juice over the top of the whole bowl. It has all of the wonderful taste to match the best meals in the world, and the textures always amaze me as it all just sort of melts in your mouth. Hmmmm, I might just have to try this with peaches when they are in season too…..
Wishing you an awesome June! **All thoughts and ideas are those of the author and in no way represent those of employers. 24/7 in the land of the online realm. I check email and Instagram on a regular basis, but rarely look at twitter. All thoughts and opinions are solely those of the author and do not reflect that of any employers.